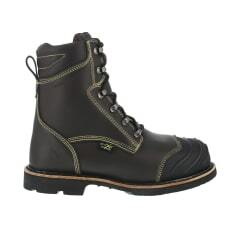 Iron Age Footwear is proud to introduce its toughest work boot, The Thermoshield. Designed and dip-tested in the toughest metal smelters in America, this 8” heat resistant boot is truly forged for the forge. Tested in quadruple-digit heat with burn-off laces, a Vibram™ Alpha TC4 heat resistant outsole, and a Poron® XRD® Internal Met Guard, this boot can stand up to it all. Welders, machinists, and casthouse operators will all love the design and protection of The Thermoshield. For more information, click here. In case you haven’t noticed, we make work boots. That’s it and we’ve been doing it for about as long as there have been work boots. Our name first appeared as we and the nation prepared for world war 1. In 1918, hard-fiber toe caps were introduced to our protective shoes. And in 1925 we were one of the first boot-makers to utilize brand new steel-toe technology.